In my part of the world, Winter has finally arrived in all of her glory and we are now at Imboc, a wintry holiday of renewal and regeneration (ok, so some people say that Imbolc is the first sign of spring; I consider it a winter holiday and celebrate it as such. There are no real stirrings of spring here till late February or early March when the maple sap begins to run). In today’s post, I’m going to share with you one of my favorite Imbolc activities–unfolding sacred patterns and symbols upon the inner and outer realms, using snow as our canvas. This is a delightful outdoor activity you can do while we have snow coverage during this quiet and most sacred time of the year. For those that are already groaning and saying “Oh no, not more snow!” please scroll to the bottom of this post, to the “Shifting Mindsets” heading and read that first :). Fresh snowfall blesses us an incredible canvas upon which to work, to imbue ancient patterns of sacred meaning. 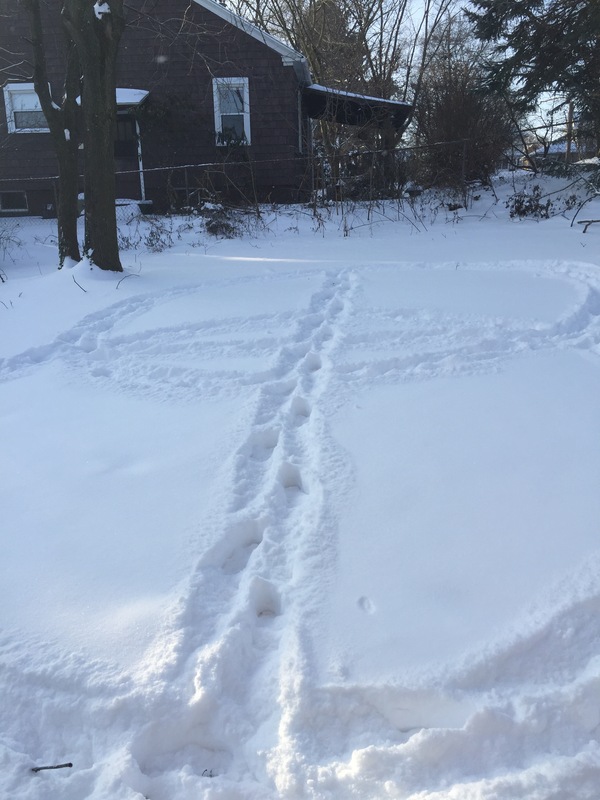 The act of creating sacred geometrical patterns, mandalas, or other symbols in the snow allows you to embody those patterns through the simple practice of walking meditation. This act creates not only a blessing from within, where those patterns unfold on the inner planes as you walk them, but also a pattern for blessing our land on the outer planes. This blessing can resonate for weeks, months, and years after the patterns themselves melt away. There are few things we can do in winter that are so simple, and yet so profound. I use the strategies I’m going to be sharing today with you as either the main celebration ritual that I do for Imbolc, or as a large part of that ritual. The photo above was taken at Imbolc last year (2015). 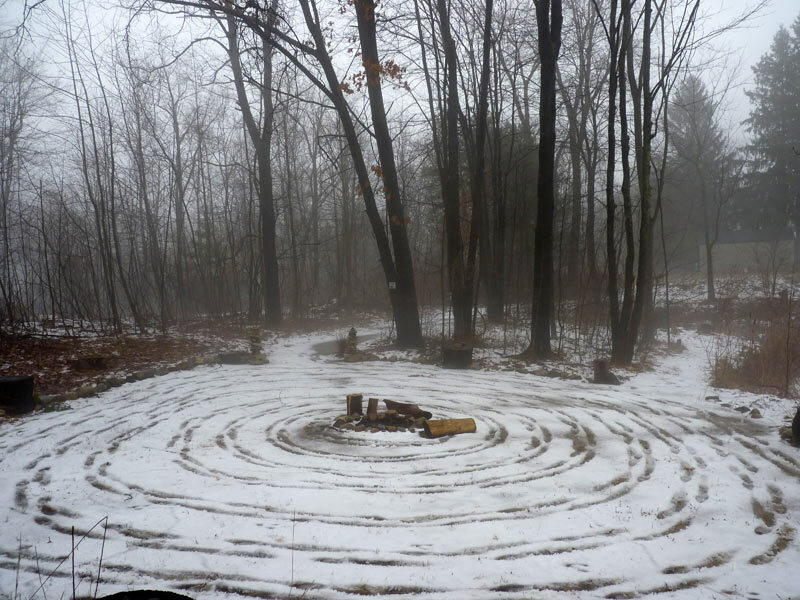 My friends and grove members gathered on the frozen pond at Imbolc, where we created an “unwinding” spiral (counter-clockwise) to unwind and de-stress as we went deeper within. Then we laid upon the ice in the center of the spiral for a time, and, when we felt ready, we “wound back up” and brought the positive energy, rejuvenation, and clarity to ourselves as we went out. This ritual was conducted when I had just been offered a new job in home state of Pennsylvania and was making a decision that would have life-long ramifications–the act of walking this snow spiral helped clarify, for me, the next stage of my journey. I cried as helped create the spiral, unsure of the best path. But by the time I had walked back out of that massive spiral, I knew the answer to my decision: I was going home. These practices can be profound, indeed! So let’s take a look at this process and how it can unfold as a sacred magical practice or ritual. Your Snow Canvas. First, find yourself a snowy space, of any size. It doesn’t have to be completely clear–in fact, trees, stones, or other features can add their own beauty to the design. My favorite place to walk on my homestead was my frozen-over pond, once I was sure it was frozen :). It was a perfectly flat surface and usually had less snow than the surrounding areas. My other place that I always traced symbols was my sacred circle. Since moving to a new state and living in town, I have found that my tiny backyard and even local parks are good spots to do this. You can even do this on a small porch or balcony. Even a tiny patch of snow can be used, where you trace the symbol with your fingers rather than your feet. The snow can be fresh or even starting to melt (as my second photo suggests) Once you have selected your canvas–it is time to select your symbol. Symbolism. There are two ways to go about selecting a symbol. You can choose to use a symbol for a specific purpose and meaning (see the next section) or you can choose to create an organic symbol from what emerges. I’ll cover both practices. Selected Symbol. Set forth in your mind the symbol you wish to create. Envision that symbol already traced upon the snow–how large it will be, how you will need to walk to form it, where its boundaries are and spend some time in this visualiation process–it will help you plan things out, especially for more complex symbols. Visualize that symbol in an appropriate color (yellow-green light or white light is a good choice), already there upon the landscape. All that you will need to do, then, is follow the pattern. Intuitive Symbols. The alternative is not to select a symbol at all, but simply to begin walking and see what symbols unfold within and without–I’ve done this numerous times with my eyes closed in an empty field. I also like weaving spirals among the trees in a forest in this manner. Establish Sacred Space, Ground, and Center. As you are ready to begin to create the actual symbol, you can choose to open up a sacred space at this point (I use the AODA’s solitary grove opening for this), but its not always necessary. Since I usually do these snow symbols as part of a seasonal celebration, I usually will open a space, standing to the side of my selected “canvas” and then include my canvas in the ritual space. If nothing else, however, you can take three deep breaths, clear your mind, and begin to walk. Walk the shape. The process unfolds from the simple practice of walking. Walk slow and purposefully. As you walk, set your intentions for the work you are to do. It might inner healing or direction (as my opening example suggested). Or, it might be a strong land blessing. As you walk, with each step, imbue that energy into the space and into the symbol. Note that you can use the symbol again and again as long as the snow remains on the ground–so it might be that you start with a land healing symbol, and once that’s firmly established, you then walk it again for some personal healing. Another note here–the more snow, the more challenging walking may be. I remember a few years ago when I was making one of my pond spirals and it was over a 20″ deep–I had to walk that symbol many times to really have a nice path, but it was a wonderful experience to do so. Return often. Even after you’ve walked the shape, you can continue to come back to it. 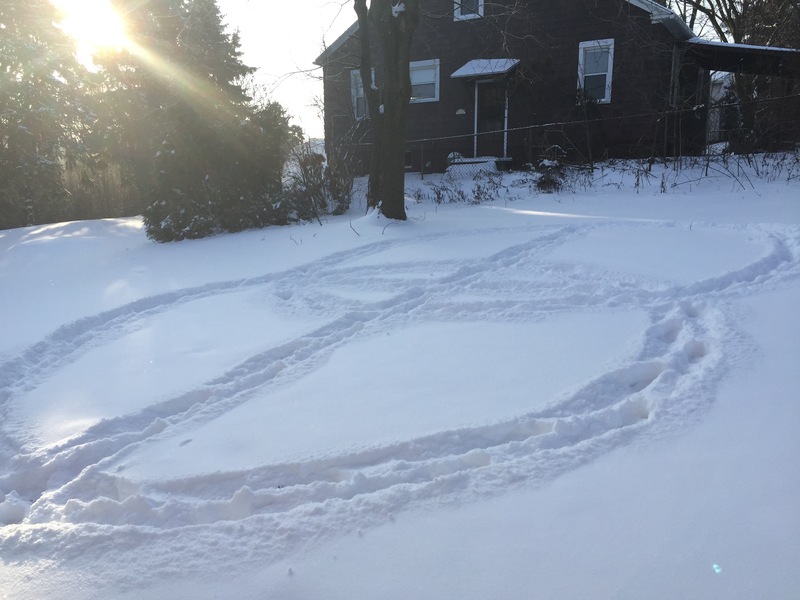 A few winters ago, during the year of polar vortexes, I had symbols in the snow that continued to persist for several months! Each day in the month of February, I would come home and walk the pond spiral before going into the house. It was a great way to reconnect with my sacred land. You can also rewalk the symbol with fresh snowfall. The longer the symbol persists, the more energized the space will be. Vesica Piscis and Cross Design in Recent Snowfall in my backyard in town – this was walked one time. The symbol you choose to create and why you create it is an important part of this process–and like all other magical acts, you should consider this carefully before you begin. 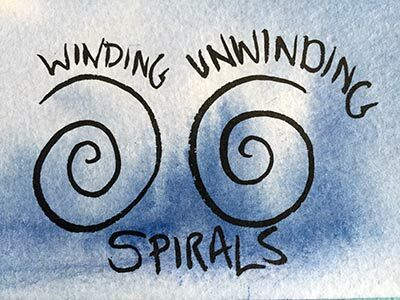 When my grove came together last Imbolc to create the spiral, each of us were faced with a major issue in our lives that needed some guidance–and we created the spiral primarily for that purpose. If you have no direct intentions, then saying you are “open” is a good one! Also, the land can *always* use a blessing, and certain symbols are particularly good for that. The Pentagram and Pentacle are symbols over 5,000 years old, used for a variety of purposes, nearly all of them protective in origin. 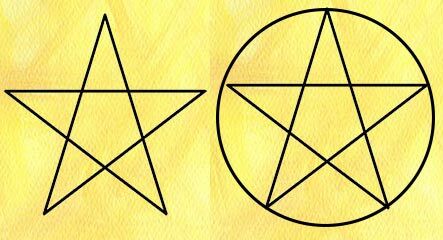 A pentagram is a protective symbol that radiates that energy outward with the five points. A pentacle contains the energy within the five points as it is surrounded by a circle. If you wanted to do a blessing and protective symbol for the entire land, a good choice would be a pentagram. If you had a sacred space you were working on empowering, say, a stone circle or garden, you might choose a pentacle instead to keep the energy contained within that space. Spirals are my favorite of the snow symbols to create because they can be very easy to create, requiring nearly no thought, and yet profound. Spirals are likely one of the oldest symbols in human culture, and can be found in paintings in caves and carved in stones as far back as 8000 BCE. The spiral is representative of many things–to the Ancient Celts, one meaning was the life force or cycle of life. Spirals reinforce the notion of a cycle or season upon us, and are particularly useful for meditation and walking meditation. 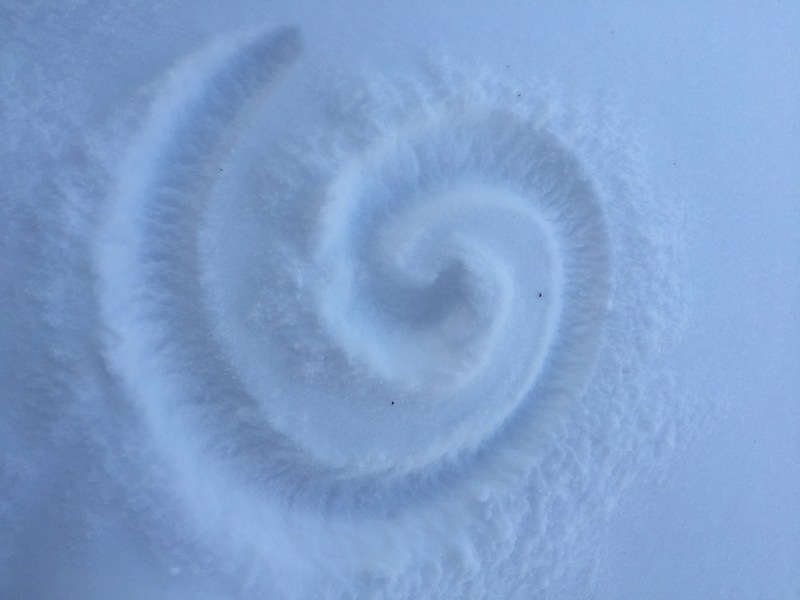 I have found that my snow spirals have a twofold effect–they encourage a deeper awareness and meditative state where I can work out various deep rooted issues, but they also have a profoundly energizing (winding) or clearing (unwinding) energy about them. A second kind of spiral, a bit harder to get right in the snow, but no less profound is the one that unfolds from the golden mean. 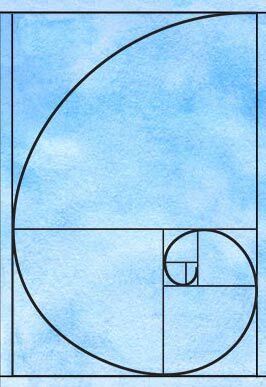 This spiral is created from the Fibonacci sequence (1, 3, 5, 8, 13, 21….). Entire books have been written on the meaning of this spiral (here is a nice overview)–a most basic understanding of it is that it is what connects the heavens and the earth; we see this spiral reflected in the shape of the Milky Way galaxy all the way down to a simple snail shell. This same sequence is present in the many ratios of the human body, the notes on a scale, the pattern of a sunflower or the branches on a tree. When I walk this spiral in the snow, I see it as a connecting spiral, a spiral signifying the universal gnosis, the oneness of all living things. Walk this spiral and see what unfolds from it. Another symbol for snow workings is the vesica piscis–another ancient symbol drawn from sacred geometry with profound implications. 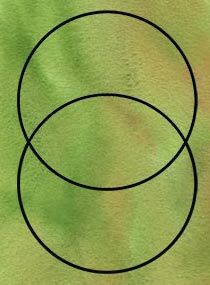 The vesica piscis is reflected on Glastonbury’s Chalice Well as well as in various religious art and symbolism; it literally means “the bladder of the fish.” It is a symbol representing unions of many kinds–the union between heaven and earth, between humans and nature, between male and female, between light and dark. When I create this symbol in the snow, I see it as a promise–a sacred pact between myself and the lands that I serve. This is the one I walked last week in the snow–a promise of unity with my land. Of course, no discussion of sacred symbolism on a druid’s blog can be complete without a discussion of the Awen symbol! Not nearly as ancient as those above, the symbol still carries profound energy–the energy of creative awakening, divine inspiration, and the arts. I draw this symbol when I want to bring those blessings into my life or into the lives of those around me. 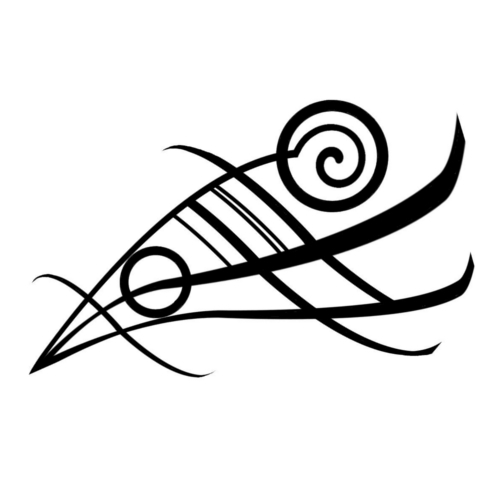 This symbol is particularly good for workspaces or areas where creativity may flow–consider, for example, using this symbol near a fire pit where the bardic arts are often shared! The final symbol I wanted to direct your attention to specifically for land protection is a symbol developed by the pagan group against fracking, The Warrior’s Call. This is is the newest symbol here, but it is being actively used by many around the world to energetically address fracking and protect the lands from fracking activities. I have found that this symbol is fairly complex for the snow, but its do-able. I have recently used a simplified version of this symbol during our latest snow fall here in Pennsylvania, near some gas wells, given that I live among the oldest sites of Fracking in the USA. This symbol works well as an acknowledgement of the land’s suffering and pain. I think this symbol is highly appropriate for snow sigils in areas being fracked or under threat of fracking or other duress. These symbols presented here are few among many, many, many others that you can work with. Be creative and consider what personal symbols or those from the ancient mystery traditions might be most appropriate to your purposes and path. This special section is for those who want to work snow magic, but have a problem with the snow :). I am a great lover of winter and the snow, and I find it to be an incredibly magical time of year. The icicles and shimmery ice on the trees, the gentle snowflakes falling to the ground, the rich carpet of whiteness across the land. The more that comes, the happier that I get in these cold and wintery months! However, so many people do not share that sentiment. Yet, if you are are going to do magical workings with the snow, like anything else, you need to come into it with the right mindset. For some, winter can be a very hard time due to seasonal affective disorders, managing the snowy weather and work schedules, food insecurity, or other issues. I laid out this fully in my post on cultural challenges surrounding our relationship with snow–if you haven’t read it, its well worth a read. If you do have serious issues with the snow–I suggest you seek out the root of your discomfort. Is it that you don’t like driving and have to go to work when its snowing? That may be an underlying issue with rigid work rules and inflexibility or economic insecurity. Is it that you don’t like getting stuck in your house with limited food during a storm? Perhaps that’s an issue of food insecurity. Perhaps its the chilling cold–few modern clothes are designed to be sufficiently warm (wool socks have changed my life). Perhaps, your discomfort isn’t your own, but rather the collective’s continual complaining and demonizing the winter. We have a copious amount of negative media coverage surrounding natural weather phenomena like snow (a visit to weather.com’s page will demonstrate this in spades–I get stressed just looking at their homepage). If you are on social media, there’s no shortage of it there either. The problem with all of this negativity wrapped up in snow is that it blinds us to the beauty and magic of this time of year. And, just as importantly, if you are going to attempt to do the snow workings and sacred activities laid out here–its important to make sure you are putting the right energy into it: loving energy, peacefullness, and goodwill! As within, so without! This snowy ritual I have shared can be used for an number of different purposes, and can deeply weave patterns of energy into the landscape–both inner and outer. 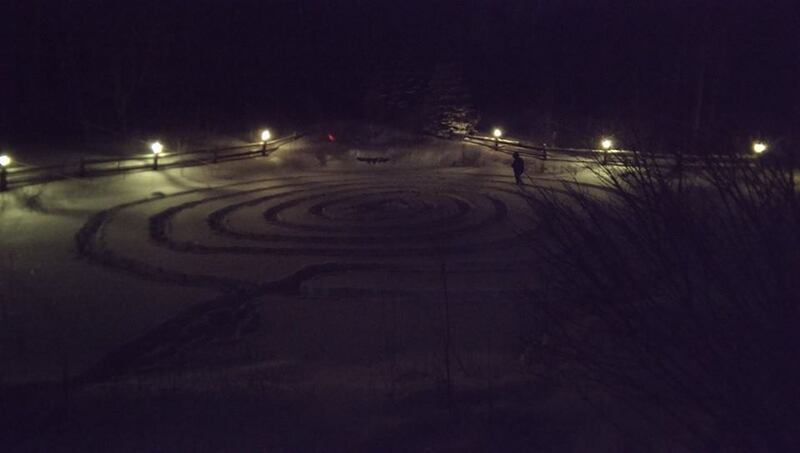 After doing spirals on my frozen pond for a number of years, I had a druid friend visit me for the first time a few summers ago and he said, “wow, your pond has some spiraling energy going on!” And I just smiled and said, “Yes, it certainly does.” Even after the snow has melted, the energy that I raised in that space becomes part of the energetic underpinnings of the land for years to come. It can be further reinforced with other kind of sacred space, plant, or stone work! The sky is the limit…or perhaps, the snowfall :).